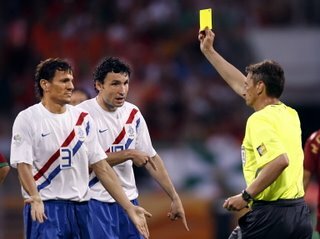 In honor of Le Tour De France getting underway this weekend, let's talk about yellow cards for a minute. As important as they have been to this point (no Deco for Portugal Saturday), from here on out they are massive. Each team has a few players that are "on a yellow", meaning that one more will mean that they miss the following match. Missing a key player is never good; missing one for a World Cup semifinal or final can be devastating (Ballack, Germany, World Cup 2002 final; Nedved, Czech Republic, Euro 2004 semifinal, etc.). Pay attention to which players are on a yellow already and watch to see if they play any differently overall or if they avoid hard tackles specifically. Each of these teams will be playing their 5th match in the last 16-21 days, and some are playing their quarterfinal on 3 days rest while others are on 5 days rest. This is definitely more grueling than the regular club season, where usually they play 1 match every weekend with a midweek match thrown in on many weeks. So fitness at this point is paramount. In addition to this, having a deep squad is also a massive advantage at this point. Lastly, all of the teams are so tired at this point that having a player sent off and having to play a long time with only 10 men will be even more of a disadvantage that it was in the first stage. Oh, and all of this is on top of the fact that the club soccer season runs from early August to mid-May every year. In a non WC year these guys play a 10 month season and have just under 2 months off. Compare this to the 6 month offseason in futbol Americano or 4-5 month offseason in the NBA and NHL. This year they had 3-4 weeks "off" between the end of the club season and the start of the World Cup. However, the fact that most of that was spent training & preparing with their national teams means that many players have done all this in the last month on about 1 week off. Since last July. 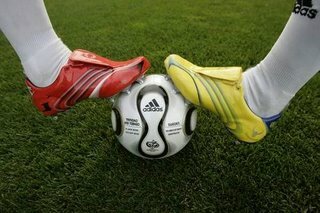 Every World Cup a new ball is introduced and gets alot of pub because it is invariably made with some new space age technology that makes it bend and swerve like nothing before it has. Usually we mostly hear complaining about it from the goalkeepers, and as expected there has been lots of talk about the new ball and it's flight. There have been some crazy goals scored at a long distance that have had just as much to do with the ball than with skill - Torsten Frings bender for Germany in the opener and Joe Cole's crazy looping bender against Sweden come to mind. This aspect of the ball has been much talked about. But I have also noticed something else about this ball that I think is actually helping the goalkeepers that is not being talked about nearly as much: shooters seem to be having a really difficult time keeping the ball down on longer shots. In just about every match you see several shots that are blasted way over the bar. This happens regularly in soccer, but it seems to me that it is happening more than normal with this ball. I have even noticed this on penalty kicks; in the round of 16 alone I remember the Sweden guy kicking a straight-up field goal and one of the Swiss kickers blasting off the bar. Usually penalty takers don't miss high, although there certainly are famous ones that stand out (Baggio in the 94 WC final, Beckham against either Turkey in qualifying or Portugal in the Euro 2004 shootout, can't remember which it was). Anyhow, I could be baked but it seems to me like it is harder than ever for shooters to keep it down, which in a way actually makes life easier for the defense and goalkeeper. Something to keep an eye on as we move forward. Three of the remaining 8 teams are being written off in varying degrees because they have underwhelmed to this point: England, Ukraine, and Italy. This does not mean that they are incapable of getting hot and marching all the way to the final. As I mentioned earlier, in the 1982 World Cup Italy started out playing poorly. They drew all 3 group stage matches and just snuck into the next round on the 2nd tiebreaker of goals scored, where Paolo Rossi caught fire and they dispatched Brasil, Argentina, Poland, and West Germany to become improbable champions. In 2002 a not-all-that-impressive Germany team rode a hot goalkeeper, some timely goals and a few other breaks all the way to the final. So to me it seems foolish to write off any team's chances at this point. We are definitely at the anything can happen stage.